The hardest part of making these parfaits is finding the small pearl tapioca. Fresh Market came through for me after I struck out at two other stores. You might want to order it online and save yourself some driving. Use your favorite berries or a combination. I like blueberries and sliced strawberries, especially when they're in season. Frozen berries will work, but thaw them first. Pour the almond milk into the electric pressure cooker. Stir in the tapioca and almond extract. When the cooking is complete, hit Cancel. Allow the pressure to release naturally for 10 minutes, then quick release any remaining pressure. Once the pin drops, unlock and remove the lid. Remove the pot to a cooling rack. Stir in the maple syrup and let the mixture cool for about an hour. 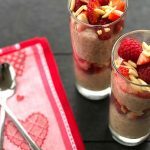 In small glasses, create several layers of tapioca, berries, and almonds. Refrigerate for 1 hour. Ingredient Tip: Tapioca is made by extracting starch from the yuca root (cassava). It comes in four primary forms: large pearls, small pearl, instant, and flour. The large pearls are seen most often in bubble tea. The small pearls are featured in tapioca pudding. The instant variety and the flour (which is gluten-free) can be used as thickeners.